We made the decision to let the puppies be born with us in the office. This is an area on the ground floor of our house, which is directly adjacent to the living room. The mother dog can give birth here in peace with the familiar presence of us by her side. In this way, we can monitor the puppies the entire day, especially during that exciting time when the puppies are still very little and vulnerable. 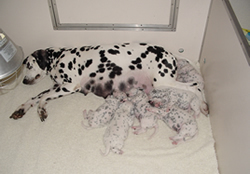 The puppies need a lot of rest during the first three weeks, and of course enough breast milk and care. That’s what they get with us in the protected and familiar environment of a large, clean and warm whelping box. After these first three weeks, the puppies can open their eyes and ears, and their second phase of their lives starts, the discovery phase. The puppies now move to our heated indoor space. This is a spacious scullery that has been completely designed for raising a litter of puppies. The area is tiled and easy to clean. This room is of course provided with daylight, through the presence of a large window. There is nothing worse for a puppy than having to grow up in a dark shed or a basement without daylight. From their indoor space they can move through a closable passage to a fully covered outdoor area. In this way, they can safely, but mainly dry, play outside. They are not at all bothered by rain or wind. A major advantage of this connecting area is that the puppies quickly learn to relieve themselves outside. Of course this area is easy to clean. This area is furthermore adjacent to the sitting area of our backyard, so the puppies are directly within our vision when they’re outside. From this covered outside area, there is a direct passage to the large sheltered puppy meadow.